The yukata. This is the formal dress of Kinosaki Onsen. Putting on a yukata, which is one of Japan’s traditional dress, is the first step to enjoying Kinosaki Onsen. I understand that some may be a little reluctant to wear a yukata for the first time, I get it. But if you want to fully enjoy and get the best out of your trip to Kinosaki wearing a yukata is key, and it’s not like wearing a costume in Disneyland and not awkward like wearing a business suit on the beaches of Hawaii. Personally, I think that wearing a yukata around Kinosaki is less standout-ish than if I were to wear a kimono in the building packed city of Kyoto, and I don’t think it feels a thing like cosplay or playing dress up. Before you overthink the idea, please just give it a try first. Therefore, it’s important to have the mind set “Don’t think, wear!”. And, by the way, Kinosaki Onsen’s slogan is “We are Japan’s best yukata matching town” and there is a thing like a “Kinosaki Yukata Constitution”. Check out some of the “codes” below. Wearing a yukata is not playing dress up. In Kinosaki Onsen, the yukata is commonly worn as the formal dress of the town. 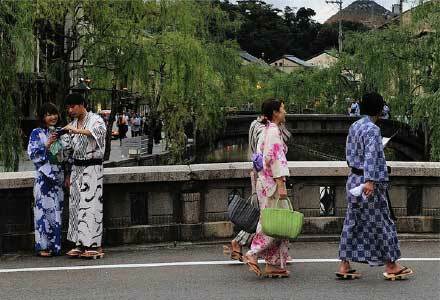 By all means, change into your yukata before heading out into the town and when going to visit the public bathhouses. 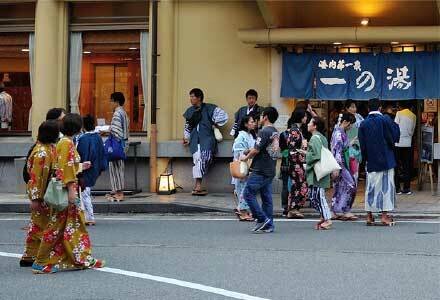 In Kinosaki Onsen, people who wear yukata (traditional Japanese clothing) are seen as distinguished. But first, one should know how to properly wear the yukata and coordinate your own style. Get to know the warm bliss and new styles of the yukata. When you put on a yukata you can discover a new elegance to yourself that you haven’t noticed before. To create a day of unforgettable memories. You are sure to make plenty of wonderful memories just by wearing a yukata for the day. This is a piece of Japanese goodness that you can not experience in the city. I feel that the yukata fosters a rich mind. The Town Becomes Your Runway, Now Work It! The image of the yukata reminds people of their natural beauty and conveys the person’s kindness. When you wear a yukata, you feel good about yourself both inside and out. Why not? 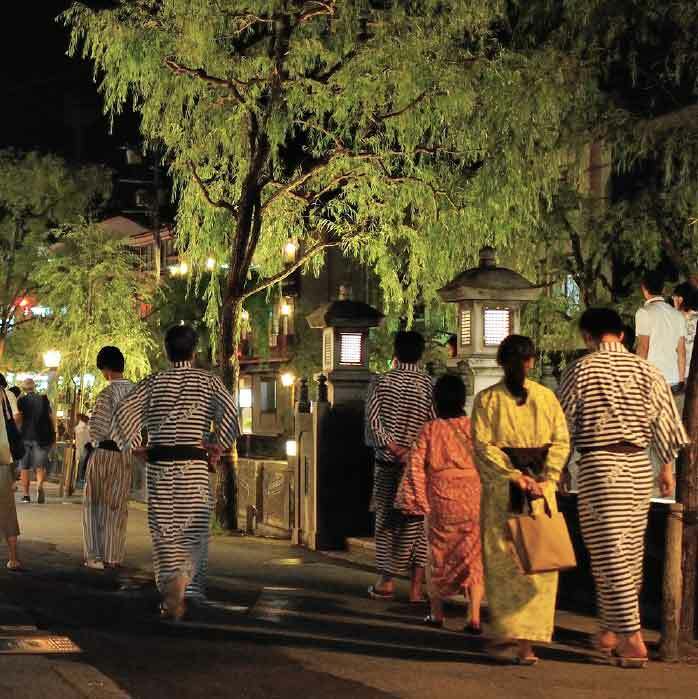 Why would walking around Kinosaki Onsen in a yukata be embarrassing? If you take a look around everyone is enjoying a stroll around town in their yukata and geta. In addition to the old-fashioned yukata which have the crest of their appointed inn, the number of inns that offer “color yukata” with bright colors and patterns have also increased, making the hot spring town even more gorgeous. Putting on a yukata is actually pretty simple. First, the yukata provided by inns come in large, medium or small, choose one that fits you best, these are usually sized so that you can easily wear it without having to tuck and fold in the length. Cross the left over on top and tie it with the sash, and your done. There isn’t any particular way to tie the sash, but if you tie a bow on your left side it will be easier to undo and take off when you go to the hot springs. When wearing the slightly more complex color yukata, the ryokan proprietress or room attendant can show you how to put it on, feel free to ask for their help. Apart from that I am also asked “Isn’t it too cold to wear the yukata out in the winter?”, in the case of the ryokan yukata you are provided also with a “tanzen (padded yukata)” that you can layer on for warmth. In addition to that you can also layer on a “haori (yukata jacket)” for the perfect protection from the cold. So there is no need to worry. Mini Yukata Photo Shoot Anyone? 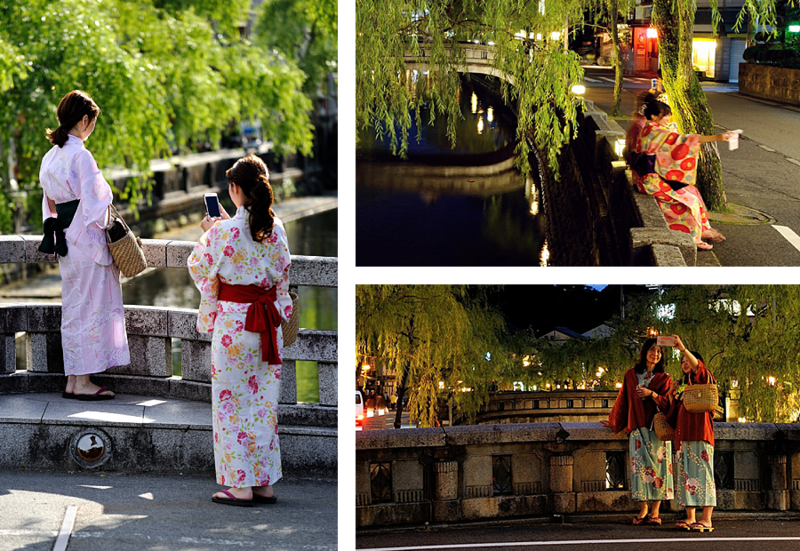 Take some pictures of yourself in your yukata to remember your trip by. First take some inside your inn. Kinosaki Onsen’s ryokan are filled with Japanese-style architecture, obviously the rooms, but also the lobby, corridors and other areas are be fitting of the yukata. In town some great places are in front of the bathhouses, Shisho Shrine, or inside the precincts of Onsenji Temple. And oh yeah! Standing in front of the “hibuse wall”, a wall with an interesting geometric pattern, which is Kiyamachi’s signature spot, would make for an interesting picture. In spring the sakura in full bloom along Kiyamachi Street, standing on one of the bridges over the Ootani River lined with willows that are a vivid green in the summer are also recommended photo spots. And the snow scenes in winter also make exceptional shots. Because I have become somewhat accustomed to these scenes I often tell guests “If you take it here this is what it will look like.” I honestly feel that out of all the towns in Japan this town is the best match for yukata. Oh, and there is a shop in town where you can purchase yukata. A souvenir unique to Japan and one that should not be missed.